There is no denying the fact that mouse is the most important device of the PC gaming arsenal. The modern era is of wireless gaming mice. This latest networking technology has become extremely popular. Wireless gaming mouse connects via wireless networks such as Infrared waves or Bluetooth. These devices require charging or batteries to generate the wireless networks. These are highly portable, offering mobility and freedom to move around. No tangled wires lead to clutter-free desks. Gripping Styles- There are three main gripping styles – palm, claw and fingertip, respectively. In claw gripping style, the mouse is held with the fingertips. Your fingers make a large arch shape to press the buttons. The claw-grippers should prefer a smaller sized mice. Palm grip provide the hand with a relaxed position and maximum support.Palm grippers should go for a larger mouse. In fingertip style, you control the mouse only with your fingertips. Thus, claw grip works well for fingertip grippers, too. The gamers who require repeat rapid movements, should go for claw gripping style. Sensor- The Laser vs. Optic mouse sensor. Optical mice are any day better and more accurate than laser mice. A Laser mice can adapt to almost any kind of surface, but for PC gamers optical mouse sensor works best. DPI- Mouse sensitivity is measured in Dots per Inch (DPI). Higher DPI indicates, faster mouse movement and less physical distance to move the mouse. You can always adjust the DPI as per your playing technique. Left, Right, or Ambidextrous Gaming- Most high-end gaming mice are basically made for right-handed players only. However, lefties can always opt for Ambidextrous Gaming mouse that are made for both left and right hand players. Acceleration- It refers to the speed of the cursor, that is calculated in G force and G equals to 9.8 metres per second. Usually, gamers prefer mouse with little or no acceleration at all. 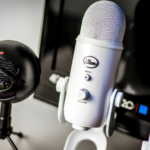 Logitech is a household name for consumer electronics. Featuring a sleek design, the Logitech G602 has two black click buttons that are quite long with blade like edges. power switch and 2500 DPI LED sensor in the middle. The left side of the mouse protrudes out providing a comfortable thumb rest.This is a right-handed mouse featuring 11 programmable controls. All of the 11 buttons are intelligently placed and use durable mechanical switches. The long-life buttons rated to 20 million clicks. This wireless mouse weighs about 152 g.
Offering a wireless range of up to 9.8 feet (3 meters) this mouse comes with a battery life of up to 250 hours in performance mode or 1,440 hours in endurance mode. It is powered by 2 AA batteries. It comes with Logitech’s Delta Zero sensor, which offers tracking sensitivity between 250 and 2,500 DPI and registers up to 2 meters of travel per second. The DPI can be adjusted via the front mounted sensitivity adjustment buttons. Five preset DPI settings can also be set-in-advance so that you can later swap between them. The DPI range may be disappointing for the serious gamers. The included 2.4-GHz receiver can be used to interact with the mouse from as far as 3 meters away. It also comes with an extension cable, in case you need extra range. The Logitech Gaming Software is convenient and easy to use, even the beginners can use it without any issue. This wireless gaming mouse comes with a warranty of 3 years. Overall, this is a great mouse for gaming that is reasonably priced. E-Blue is known for their innovative products. From the peripherals to the furniture, they provide their customers with a complete gaming solution. Featuring one of the most comfortable design, E-Blue Mazer II is made using the Air Wing concept. Perfect for right-handed gamers, it fits tightly within the gamer’s palm. The scroll wheel is rubberized with LED illumination and the bottom is made of shiny plastic. The rubberized footpads adds to the convenience. It features soft blue LED lighting and runs on two AA batteries (not included). The service life of AA alkaline battery is up to 18 months. With weight of only 90g, it is extremely lightweight and convenient. It seems a bit large, thus good for those with large hands. In total, there are 6 buttons; 5 Programmable Buttons and 1 DPI Adjustment Button. DPI button is located on the top of the mouse. The back/forward buttons are conveniently placed on side and they are easy to access during game play. Its mechanical switches are well-engineered and the OMRON micro switch provides lifespan of up to 5 million button clicks. To make your gaming experience disruption-free, it comes with 2.4G wireless transmission technology that is able to receive stable signal from 30 ft. radius. This gaming mouse makes use of the Avago 5090 Optical Gaming Chipset that allows for adjustable sensitivity settings. This wireless mouse can be set as high as 2500 DPI. It has basically four different adjustable DPI settings, 500,1200,1800 and 2500 that are adjustable via the DPI buttons located on the mouse. However, the LED light is in blue color only; so for different DPI settings the color remains the same, making it difficult to track the current setting being played. Offering maximum acceleration of 20G, it offers high 3000 Frame/second Rate for extremely precise tracking level. Overall, this is a decent affordable wireless gaming mouse. It is arguably a great pick for mid-level gamers. Co-designed and produced with the leading global mouse switch supplier, Omron, the new mechanical switches are optimized and tweaked for the fastest response times for gaming and for extended durability up to 50 million clicks. Good for both left and right hand gamers, this ambidextrous wireless gaming mouse is perfect for pro-gamers. Featuring a symmetrical design, this ambidextrous mouse, has forward and back buttons on both sides. The left and right clicks use Razer Omron switches, which provides for an amazing click. It gives you the option to seamlessly switch to wired, in case wired mode is more convenient for you. The two slightly protruded buttons on each side and sides of the mouse are coated with additional textured rubber material that provides for an improved grip. Both sides also include an elegantly thin LED strip complemented by an illuminated Razer logo on the palm rest. The left side features two buttons and an LED: one button for switching the mouse off and on, and one for moving around four stored profiles.The five Teflon feet at the bottom allows smooth movement of the mouse. This mouse feels slightly heavier as it weighs in at 106g. It features 5G laser sensor, which supports up to 16,000 DPI and 210 Inches per Second (IPS) tracking. The wired version is USB, while the wireless edition connects via a small 2.4 GHz proprietary USB dongle. It can track up to 50Gs of acceleration and supports polling at 1000Hz.The mouse features four profiles that are stored in the Lancehead’s internal memory. The handy LED assigns each profile a different color— red, green, blue, and cyan. To program the Lancehead’s four onboard profiles, you’ll need a program called Razer Synapse Pro. This mouse is hybrid on-board and cloud memory that allows flexibility. 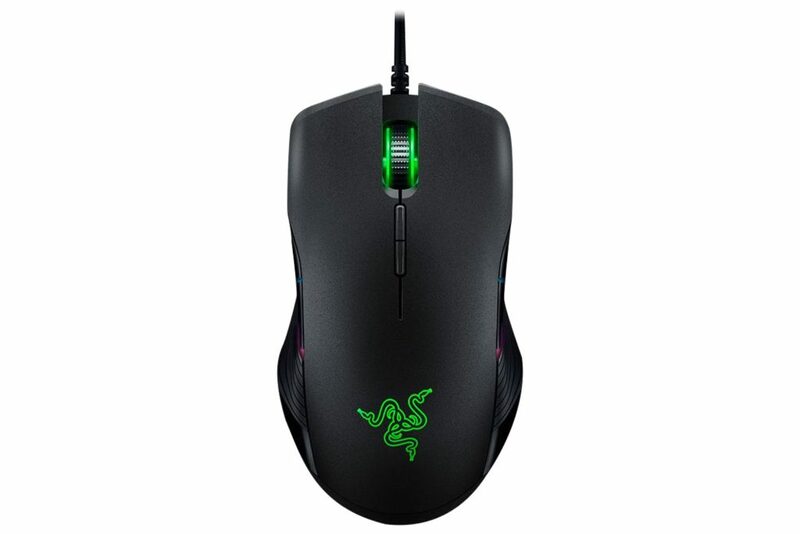 It is powered by Razer Synapse Pro (Beta) software, so you can save your settings directly onto the mouse as well as to the cloud, making it highly convenient. Equipped with Adaptive Frequency Technology, this mouse works effortlessly. The AFT technology is the main reason behind wireless communication. In case of any disruption, it allows the mouse to seamlessly switch frequency channels for an abrupt-free working. It comes with nine programmable buttons that can be customized through the company’s Razer Synapse software that is absolutely free. As it features a default setting of ‘dim’ level of brightness, it works good for approximately 24 hours. Overall, due to its ambidextrous nature, this is accessible option for everyone. Featuring a good build quality design with excellent RGB lighting capabilities, this is a fantastic mouse that is totally worth the money spent. Featuring a comfortable, ambidextrous design this wireless mouse delivers top-notch performance. The ambidextrous design makes it comfortable for both left and right hand users. 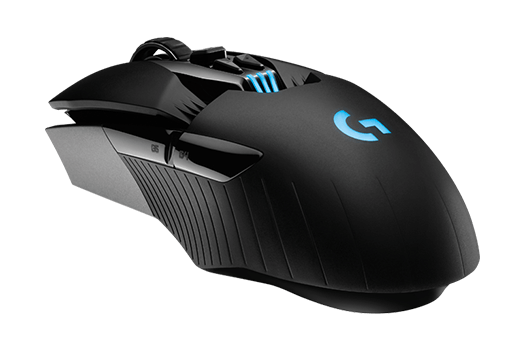 The G900 is a small, lightweight mouse that features a symmetrical design. It weighs in at 107g. All the buttons on this device are conveniently and well-placed. In total there are 6-11 programmable buttons on this mouse. There are two thumb buttons, a left button, a right button, a scroll wheel that clicks three ways, and two DPI sensitivity buttons in the center. Charging the G900 takes about 2 hours and gives you between 24 to 32 hours of battery life. The G900 uses the IR-LED optical Pixart PMW3366 sensor that provides for unbeatable tracking accuracy. The OMRON micro switch provides lifespan of up to 20 million button clicks. With a polling rate of 1000 Hz, it has a 32-bit ARM Cortex processor. It allows for seamless switching to wired mode, even in the middle of a game. The cable length is 1.83 metres. An ultra-quick 1 millisecond wired or wireless report rate deliver incredible consistent responsiveness at any speed. It features Logitech G’s exclusive battery-saving Clock Tuning Technology, a single charge can power you through an entire weekend of gaming. It alerts about the low-battery so their is no need to worry about losing power in the middle of game play. 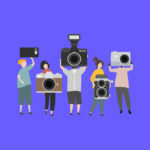 The resolution of the sensor starts at 200 DPI, and can be extended up to 12,000 DPI. A metal spring tensioning system and metal pivot hinge design gives you consistently fast and reliable click. It comes with 2.4G wireless transmission technology and record movements upto 40Gs. It comes with 2 years of warranty. Overall, it delivers excellent performance and you won’t regret buying this. Responsive and comfortable, this mouse works well for just about any genre. With premium packaging, the mouse features an appealing look. With matte black coating, the sides are coated with rubber that provides an improved grip to the user. This mouse features an asymmetrical shape, which might be disappointing for lefties. However, it has a gentle curve that makes it suitable for both claw- and palm-grip players. This mouse weighs at 125 grams, which is bit heavy. This peripheral runs on the Razer Synapse 2.0 software, which is simple to operate. As a Chroma device, this mouse has access to more than 16.8 million colors, and these colors and patterns can be set up across 16 distinct zones. There are nine independently programmable buttons, along with a tilt-click scroll wheel; all of which are intelligently placed. The buttons include- right click, two side buttons, the four scroll wheel directions, and the two sensitivity buttons that are completely customizable. With two thin LED light strips, there are two LED bands on either side of the scroll wheel. The wheel can be tilted left or right to scroll up or down a page, adding to the convenience. 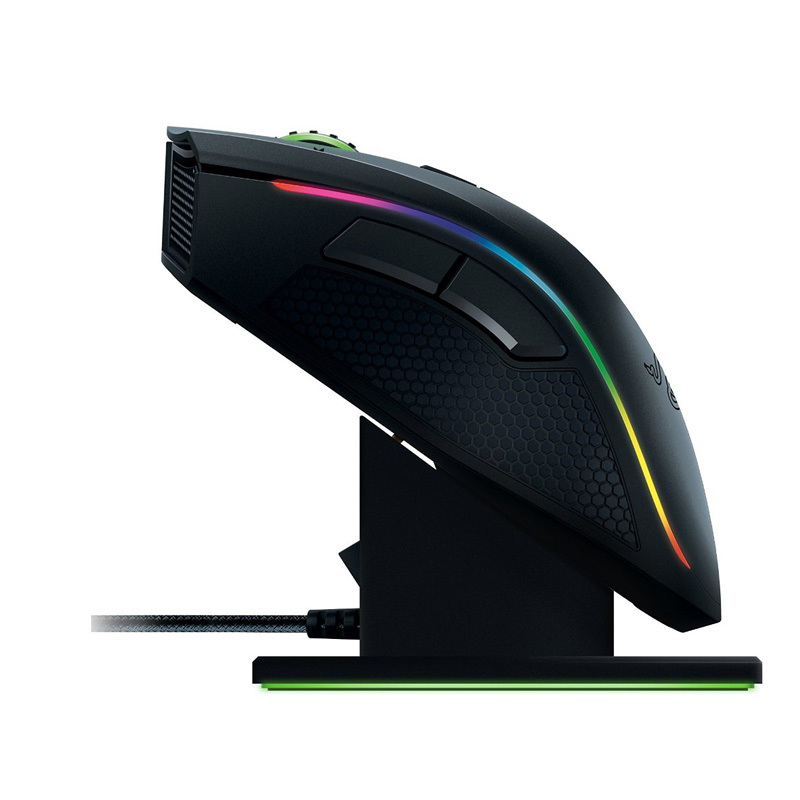 Razer has made a new addition to the mouse; the Click Force technology that gives you adjustable left- and right-click sensitivity according to your preference. In simpler words, it lets you adjust the force needed to click the right and left buttons respectively. Mamba can also be used wirelessly as it features a large, wired charging dock that also doubles as a wireless receiver. Equipped with Razer’s newest laser sensor technology, it comes with 5 G gaming mouse sensor with 16000 DPI sensitivity, 50 Gs of acceleration, and speeds up to 210 inches per second. It is capable of tracking up to 1 DPI increments and a lift-off cut-off distance as precise as 0.1 mm. Razer claims that Mamba gives you the most comfortable gaming experience- as it features ergonomics that reduce stress on your fingers when you’re actuating buttons and eliminate unnecessary finger drag points. Razer claims that the Mamba is “the world’s most advanced gaming mouse”, and they are not wrong. With unmatched set of features, the hefty price tag is completely justified. This all-purpose gaming mouse features an intuitive and comfortable design. The left side features a rubberized thumb lends a supportive feel for extended gaming. It works amazing for claw-grip gamer. It’s powered by a 32-bit on-board micro-controller. This mouse features a full 16.8-million- color RGB backlighting with amazing illumination and a few blue highlights on the mouse itself. In total, there are 11 programmable buttons, that are large and responsive. It also has adjustable hyper-fast scroll wheel that allows fast and accurate maneuvers. There are left, right, middle-click buttons, three thumb buttons, two index-finger buttons, a button behind the scroll wheel and two accessible buttons in case you tilt the scroll wheel left and right. It features Logitech most advanced and responsive optical sensor for maximum tracking accuracy. The exclusive Logitech-G Delta Zero optical sensor technology minimizes mouse acceleration and increases reliable targeting. It runs on the Logitech Gaming Software and can store unlimited number of virtual profiles on computer. However, it can store only three profiles internally. The best part about this software is its ability to scan your PC and automatically create profiles for the games that have been already installed. All the profiles can be customised easily as per your preference. It comes with an innovative feature: the adjustable weight system which lets you add the weight wherever you feel like. It lets you add a few 3.6 gram weights. You can add weight to the centre or back of the mouse, as and where you feel like. Adding weight to the area as per your preference, takes the gaming experience to next level. Another notable feature is: surface-testing capability, It lets the mouse examine the surface the player is using and optimise itself to work accordingly. Be it a high-end mouse pad or a simple sheet of paper, it works amazing on both. The sensor ranges from 200 DPI all the way to 12000 DPI. The 12000 DPI range is amazing and there are five DPI settings with fast on-the-fly switching. This mouse is incredibly responsive, and makes all the tasks easier to perform. Overall, this versatile mouse is loaded with some amazing features that are bound to turn heads on. However, this mouse may not be suitable for palm-grip users. This is one of the best claw gripper mouse that features one of the most comfortable designs. 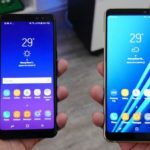 The price is truly matches the performance of this device. The performance of this wireless gaming mouse is simply unmatchable. Being an ambidextrous mouse, it is perfect for both the right and left-hand gamers. However, given the gentle curves it is more suitable for claw grippers. With 50 million click Omron switches, this mouse is all black with a bit awkward shape, but score high in comfortability. The mouse measures 1.5 by 2.5 by 5 inches (HWD) and weighs about 111 g. All the 11 programmable buttons are smooth and easy to use. The mouse wheel is adjustable with smooth scroll setting. This mouse has been designed keeping flexibility in mind. It can be modified as per your needs and preferred gaming style. The buttons on either side of the mouse are easily swappable as per your liking. With the included blanking plates, you can even let go these two buttons. 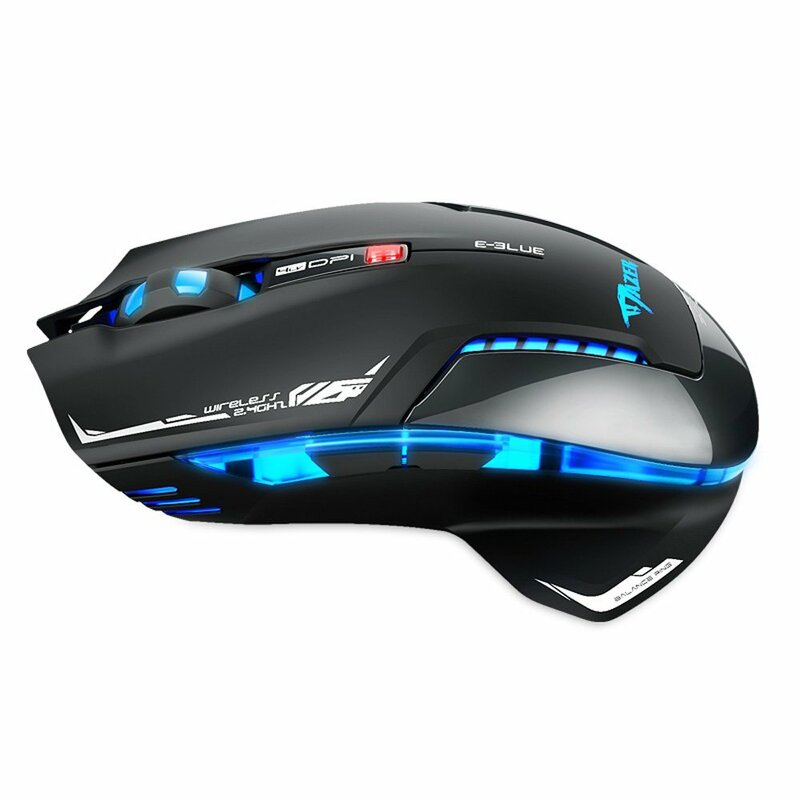 The mouse has two lighting zones; one on the logo and the other on the DPI indicators. The light on the top of the mouse also acts as a battery indicator. The color of the light depicts different purpose- three green lights means its full charge, two orange bars show the battery is below half charge and a single red light indicates that 30 or less than 30 per cent battery left. Its most revolutionary feature is its ability to wirelessly charge itself through a specialized mouse pad called the Logitech PowerPlay. This innovative and amazing feature eliminates the need for regular charging intervals and takes convenience to another level. The bottom of this mice features a small removable puck that holds a weight, in case you desire a heavier mouse. The optional weight included is 10-grams. All you have to is, remove this puck and replace it with PowerCore module component and the mouse will automatically start charging. With your mouse on the PowerPlay, it will take between 12 and 14 hours for the mouse to fully-charge itself. In case you need a quick charge, plugging in a microUSB cable serves the purpose. With the in-built 720mAh LiPol battery, Logitech G903 has a battery life with up to 24 hours of usage or up to 32 hours without any lighting at all. With 2.4 GHz wireless frequency, the RGB lighting comes with up to 16.8 million colours. The mouse can store up to five preset profiles in its on-board memory. 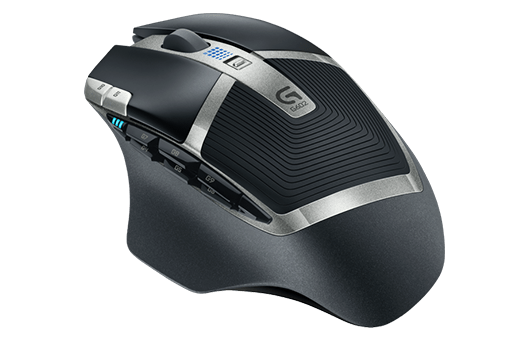 G903 has a polling rate of up to 1,000 reports per second and a maximum sensitivity of 12,000 DPI. It can retain up to five different DPI settings, that can be switched via the two mappable buttons located below the mouse wheel. The Logitech software is straightforward and easy to use. Undoubtedly, it is one of the best mouse that you can buy, but it comes at a premium price. Logitech’s Lightspeed Wireless technology with the ability to always wirelessly charge your peripheral, the expensive price tag stands justified. Razer usually design their products for the desk-bound gamer. However, Atheris is a total surprise, that has been crafted as a travel mouse. The Atheris is 3.9 inches long, 2.5 inches wide, and 1.3 inches high with approximate weight of 66g. . Small and lightweight, it is perfect for fingertip and claw grip players. Featuring a symmetrical design, this mouse is ambidextrous in nature. The body is made of plastic with a matte coating and the side grips feature texturised rubber that avoids slippage. The back of mouse has an engraved logo of the company. A small LED indicate the mode of the mouse; blue color for Bluetooth and green one for the wireless connectivity mode. The Atheris features 5 buttons, known as the ‘Hyperesponse’ buttons. These buttons work amazingly well and enhance one’s gameplay sessions. The 5 buttons include; right, left, one behind the scroll wheel and 2 additional buttons placed on the left side of the mouse to help with back and forward navigation. The button placed right behind the scroll wheel helps with the DPI switching. The functionality of these buttons can be easily changed with the help of Razer Synapse 3 software. Connectivity includes Bluetooth or a 2.4GHz USB wireless dongle. Using bluetooth as the connectivity mode, the gamer gets an unmatched 350 hours of continuous gameplay, with only one pair of AA batteries. It also gives the polling rate of 250 Hz. that equals to a 4-millisecond lag. This mouse features the Ra “Adaptive Frequency Technology” (AFT). 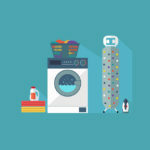 This technology scans the frequencies and signals around and seamlessly switches to a cleaner channel, in case it detects risk of any interference to the signal by any external device. With 5 different DPI settings, its DPI can be adjusted between 800 and 7200 on-the-fly. These settings can also be tweaked via the Synapse 3 software. The Atheris comes with an optical sensor that has 220 IPS / 30G acceleration. To provide the user with a longer battery life, the Razer has comprised on the feature of RGB lighting. It even lacks the battery indicator LED on the mouse. If you are fond of the smaller mouse size, this compact mouse is bound to impress you. Affordable price complied with amazing performance, Atheris is a great buy. The Dark Core is the company’s first wireless mouse and they have done quite a good job. This mouse includes almost every feature a gamer could ask for in a gaming mouse. This feature-rich gaming peripheral is a medium-sized mouse with a two-tone design. It is constructed from a tough aluminium chassis. The jet-black look on the top and sides and a textured plastic on the front, completes the look. It includes a distinctive side button and the side-grips are easily interchangeable for the right side of the mouse. A thumb-scoop makes it extremely comfortable to use. It weighs in at 128g, which is a bit heavier as compared to other gaming mouse. There are total of nine programmable buttons that are intelligently placed and convenient to use. The top section includes left/right clicks, scroll wheel, mode switcher, and two DPI toggles. The left side includes the backward and forwards button with a snipper button located between them.The Omron switches make the operations smoother and are highly responsive. The multi-zone RGB lighting can be truly customised via the Corsair CUE software. Featuring 1ms latency and a maximum DPI of 16,000 and 1,000Hz polling rate, the Dark Core RGB SE delivers excellent performance.The sensitivity can be adjusted from 100 to 16,000. It features optical sensor that gives amazing tracking . Out of all the wireless charging mouse pads, Corsair’s is the first one to work with Qi® certified wireless charger or charges via USB to computer. 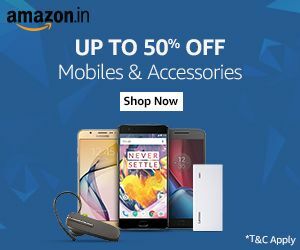 It comes with a built-in lithium-polymer, rechargeable battery and offers battery life of upto 16hrs with standard lighting and 24hrs without backlighting. It comes with two year warranty. 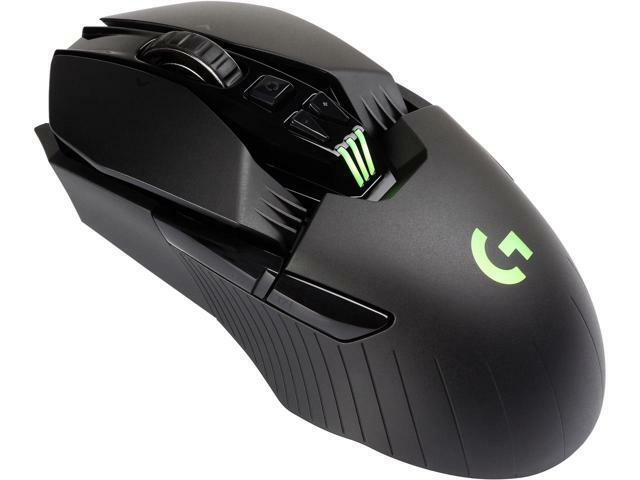 Reasonably priced, this gaming mouse is feature-rich and extremely comfortable. It is completely worth the consideration. Logitech is one of the major manufacturers of gaming peripherals. G305 is extremely lightweight, with total weight of 99 grams. 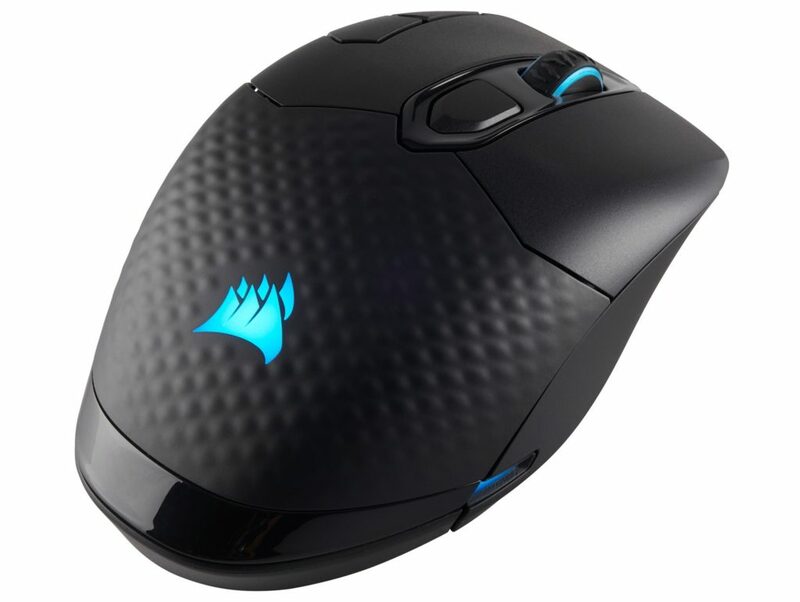 Equipped with company’s Lightspeed technology, this mouse offers a 1ms report rate. However, it also features an “Endurance” option, which raises report rate up to 8ms. It also extends battery life to up to nine months.Featuring six programmable buttons, this mouse is highly maneuverable and comes in black or white color. Equipped with HERO sensor, this mouse delivers lag free performance. It offers 200–12,000 DPI tracking. Logitech boasts of the long-lasting battery life. It comes with an amazing power efficiency that Logitech claims offers 250 hours of gameplay on a single AA battery. This mouse has a LED indicator that turns red when the battery life falls to fifteen percent. Another feature that adds to the convenience includes an additional foot on the back that increases stability. 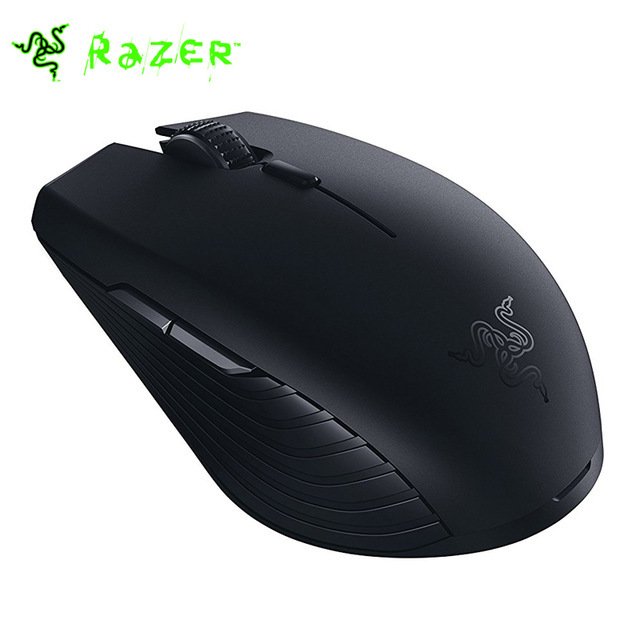 It is extremely useful for the players who lift the mouse off the pad while gaming. Overall, this is a decent mouse that offers top-notch features in a budget-friendly price. A good gaming mouse is worth every penny. But, choosing a right mouse can be a time-consuming task, especially for beginners. With lot of good gaming mice on the market the choice becomes more difficult. Therefore, research well-in-advance about the various options available within your budget and make a wise choice.